The meta question: Should I flag questions w/ XY problem? suggest that we do not flag XY problem. 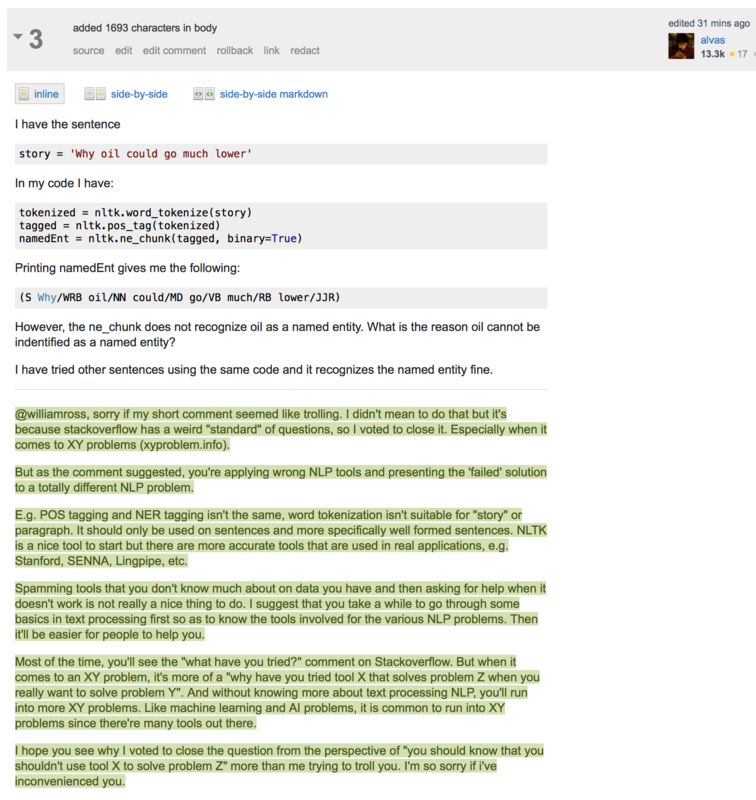 Would flagging a question like this with XY problem: https://stackoverflow.com/questions/36128920/nltk-not-recognizing-a-named-entity?noredirect=1#comment59917451_36128920 constitute as trolling? The OP of the question had use tool X on task Z and asked the question on why tool X don't solve task Y. The author has deleted the question and say that I have been trolling but I'm not sure about it. I guess I would say that I'm trying to keep the standards on stackoverflow but am I wrong? Should this question be undeleted and answered properly? BTW, I am accused of trolling the same OP on other questions too but I'm not sure about it. Is there a way to check which questions of his I've voted to close? And if they're really closed after community votes, am I really trolling him? The OP doesn't not understand the nature of the function he's using, it's an XY problem (xyproblem.info). That comes off as an insult to the capabilities of the poster. There are much better ways of pointing out what might be wrong with the question. and totally baffling. Why in the world would you do that? If they weren't already upset at the tone of your comments, vandalizing their question is a surefire way to anger someone. I recommend not doing that again. Not the answer you're looking for? Browse other questions tagged discussion deleted-questions xy-problem . Should I flag questions w/ XY problem? What should I do when the OP asks the wrong question? Closing a question that wasn't ever really a problem? Comment solved the problem and someone else copied the comment to answer. What should I do? Are “Can I solve problem X with Y” duplicates of “How do I solve problem X”? What is the correct way of closing a homework question?